North Kessock is the site of an ancient ferry route between Inverness and the Black Isle. This ferry ran, with various changes and modernisations, for 700 years, up until 1982, when the Kessock Bridge was opened. The main village consists of a long line of buildings along the shore, with a steep wooded hillside immediately behind them. the rest of the Kessock community is scattered over the hillside and through the woods, and has expanded a great deal in recent years. To the east of Kessock and only accessible by a winding country road, is the tiny village of Kilmuir. 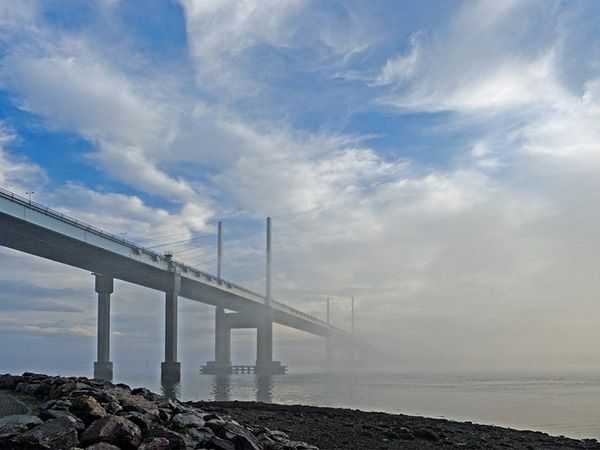 This village is hidden from surrounding areas by hills and woodland, and a view of it can only be obtained from the Kessock Bridge. It is a picturesque compact village with its own beach and small bay. Almost derelict 30 years ago, it has recently gone through a period of rejuvenation and is now a thriving, active community. The western side of Kessock consists mainly of farmland and small areas of woodland, while Ord Hill, the hill above the village is densely forested. It is a wonderful place for quiet country walks using the forestry tracks, and is an excellent place for mushrooming in the autumn. Hidden by trees one can find the ruins of an iron-age vitrified fort. Just off the A9 above Kessock is the Drumsmittal road. This is a beautiful twisting road through farmland and woodland, and it affords wonderful views. It is an alternative route to Munlochy to the east.